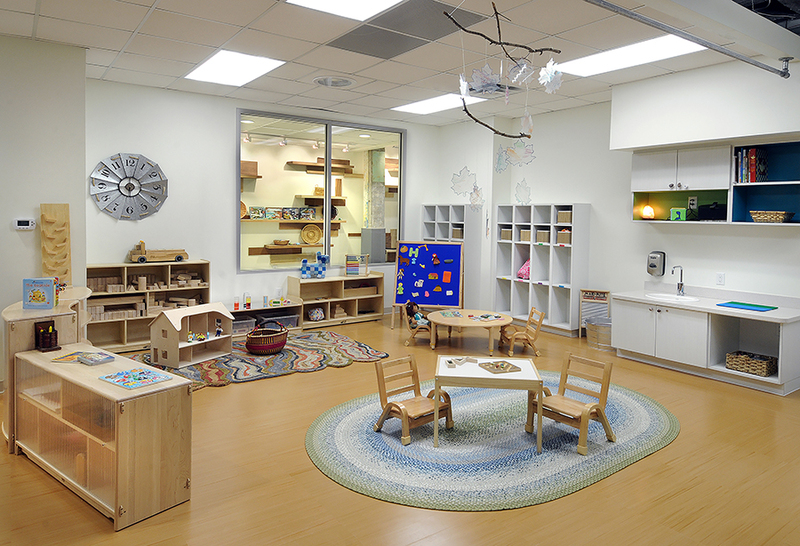 At Ahava, our environment is key to your child’s education and based on the Reggio Emilia approach to early childhood development. The minute you walk in the door, you will realize how unique Ahava really is. Love is in the air and you can feel it instantly. Since Ahava is a brand new construction, every inch has been designed with the Reggio approach in mind. In a Reggio inspired preschool, the importance of the environment lies in the belief that children can best create meaning and make sense of their world through environments which support complex, varied, sustained and changing relationships between people and the many ways of expressing ideas. 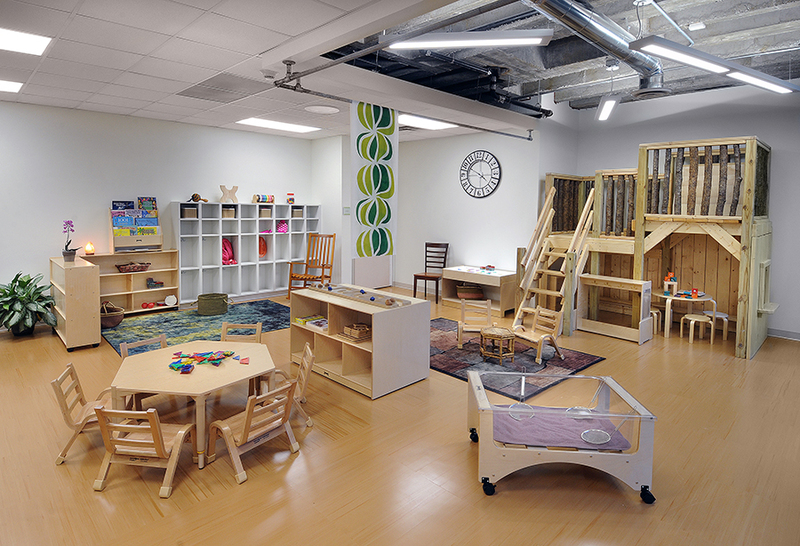 The physical environment is an inherent part of a Reggio Emilia preschool, and is often referred to as the child’s “third teacher” (after parents and teachers). Keep reading below for more exciting details! 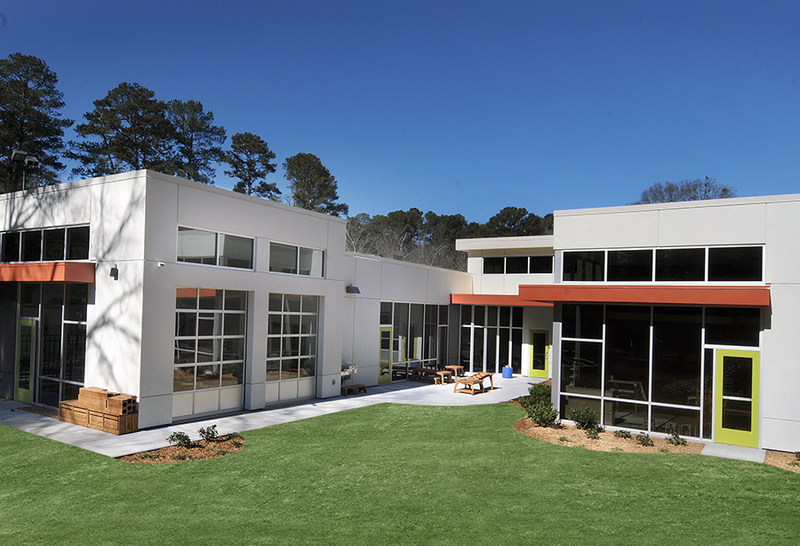 As Metro Atlanta’s newest Jewish Reggio Emilia inspired preschool, Ahava sparkles with natural sunlight through our recessed solar tubes, clerestory windows and the garage doors that, when open, provide a seamless transition between indoors and out. Floor to ceiling windows comes alive with indoor plants and (coming soon) classroom pets. Classrooms open to the Piazza, which serves as a central community gathering space, a loose-parts tinkering lab, and our school’s library. 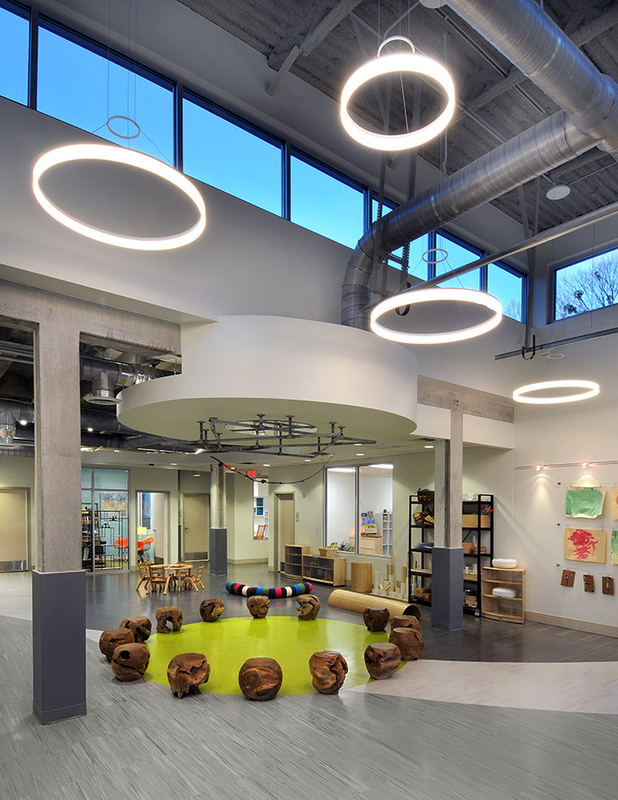 The classrooms have wall-size windows that allow sunlight to fill the rooms on sunny days and also allow the children to observe the changes in the natural weather patterns. Every classroom has a door leading outside. 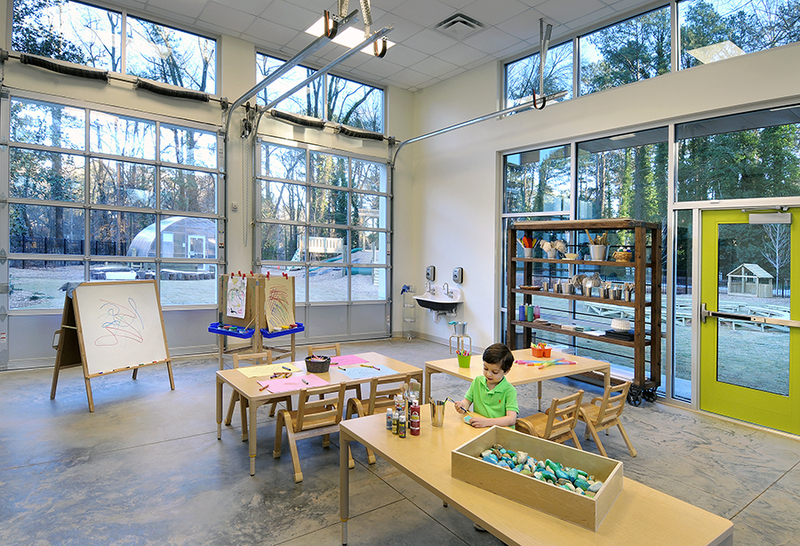 A hallmark of our indoor space is the Atelier, a designated science lab and art studio, complete with kiln room. 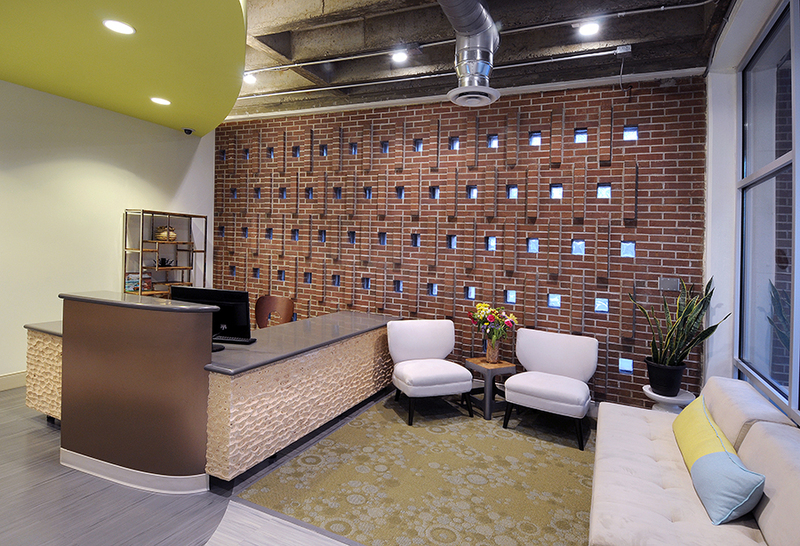 The facility incorporates clearly designated spaces for large group gatherings and cozy small group activities. Throughout the school, efforts have been made to create opportunities for the children to interact and to encourage community. There are mirrors, mirrors everywhere – an important part of helping each child form his or her identity. Family photographs abound, reminding the children that they are a members of a larger community, and helping to reinforce the home-school connection. The respect for our earth is extremely apparent. Much of the art is be “upcycled”. The children are encouraged to bring objects to recycle into art. The simple white hallways and classrooms burst with the color of children’s work, accompanied by documentation of their projects. The most important features of our beautiful new learning space are the smiling faces of both the children and the teachers. Love is in the air! There is so much to learn outside! That’s why we call the playground our Outdoor Classroom. We are very fortunate to have such a large parcel of land to use for our ideal playscape and garden area – large enough to create many kinds of learning and play experiences. Every learning experience that is available to the children indoors is provided in our Outdoor Classroom. Children have opportunities to engage in play that incorporates all areas of development: math, science, art, reading and writing, dramatic play, block building, sensory exploration, practice with social skills, as well as whole body play, such as climbing, running and jumping. The all-natural look of the play structures and rolling hills and trees ensure that the children are able to feel like they are in a very special place. Tons of fun is had on our berm (a climbing structure built into a hill! ), equipped with slides, a tunnel and climbing wall to help children develop their gross motor skills. 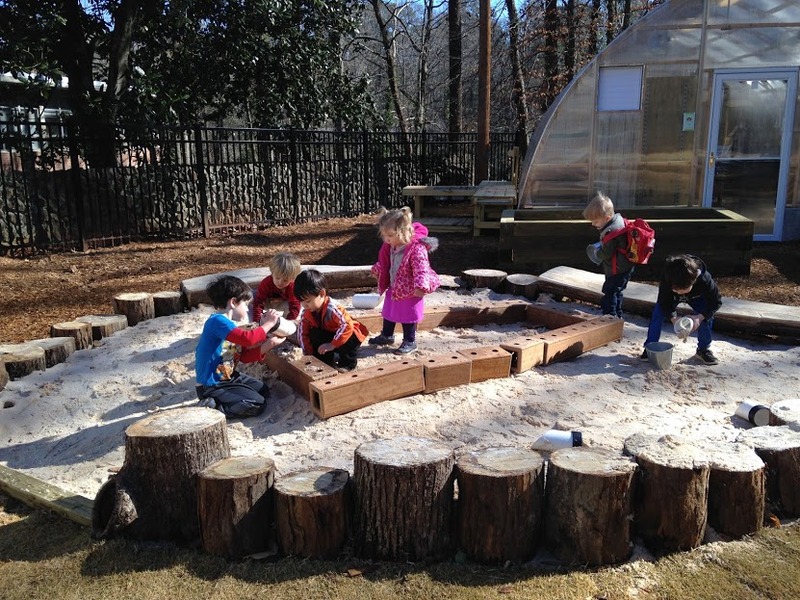 We feature a very large sandbox, a unique mud kitchen, and structures that are dedicated areas for dramatic play, art and music to let imaginations roam. Wind chimes and other upcycled materials are a large part of our soundgarden. Caring for the earth (the Jewish value known as Bal Tashchit) is a central theme outside and indoors. Our greenhouse and garden beds give the children hands-on experience in understanding how our food and flowers grow. Our rain barrel collects water to be used in the greenhouse and for outdoor water play on our cascading water table.